Back for more historical tale-telling, Director Steven Spielberg sets out to share the true and epic drama of Lawyer James B. Donovan’s life, and his conviction and dedication not only to our country, but for his fellow man as well…as we venture onto the BRIDGE OF SPIES. Engrossed in the day-to-day excitement of insurance law (ha-ha, just kidding ;), we meet family man and lawyer extraordinaire James B. Donovan (Tom Hanks). I give BRIDGE OF SPIES a rating of: MUST SEE ON THE BIG SCREEN ~ This film is absolutely FABULOUS!!! It’s true, I do love Hanks and many of the films he has made over the last three decades, and since when has the joining of Spielberg and Hanks ever produced anything less than an extraordinary film ~ Like NEVER ~ and take my word for it, BRIDGE OF SPIES is no exception. 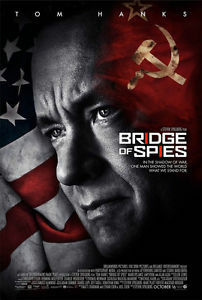 This film is SHEER PERFECTION from the first frame to the last ~ from the exquisite acting Hanks, Rylance, Alda, heck, everyone on screen…to the breathtaking cinematography captured throughout the film…to the historical significance of the storyline, that many of us may not have known anything about ~ including myself~ BRIDGE OF SPIES it’s absolutely one real-life drama that you don’t want to miss!! !